The Lexus RX450h large SUV, is a self-charging hybrid. Jeremy Webb puts it through its paces, both on and off road testing the AWD. Full review below. The Lexus RX450h large SUV really is luxurious. Luxury interior with wood and leather steering wheel, leather seats with both front seats having heating and cooling airflow. Although this is a large SUV with a V6 engine you will notice the difference between a hybrid and a conventional powered vehicle, in a couple of ways. An improvement in fuel economy through higher mpg figures. The RX450 gives a best mpg of 51.4 mpg. I managed 41.9mpg on a 70 mile A road trip heading from Portsmouth back to Lexus Guildford. The V6 engine combined with electric motor, powers the RX to 124 mpg with a 0-62mph of 7.7 secs. It is quick enough on British motorways and easily reaches National speed limit, where yo can then cruise along in total comfort and enjoy the many on board entertainment features and features provided such as usb charging points, wireless charging for driver or front passenger. A great list of standard technology means phones, tablets etc can be powered from two usb outlets, or connections through the 12v outlet. Phones can be connected through the entertainment system via Bluetooth, so your or should I say more likely the children’s music can be played and sound brilliant through the fabulous speakers distributed around the entire car. The driver has lots of technology assisting them to keep everyione safe on their travel. It is equipped with the Lexus Safety System +, a collection of features that aid driving. Lane Departure Alert notifies the driver of any straying from direction without indicating, so you do not cross in to other lanes without signalling. Pre Crash Safety system constantly monitors the road and analyizes the likely hood of a collision. Audible warnings spund if it believes impact is approaching and if the driver fails to respond by slowing or braking, the brakes are applied and seatbelts tightened. The car can recognise street signs and displays these in the cockpit display. In the door mirrors the RX has Blind spot monitors which nofify the driver of vehicles behind the car that are in a blind spot to the driver. Lights on the door mirrors function. 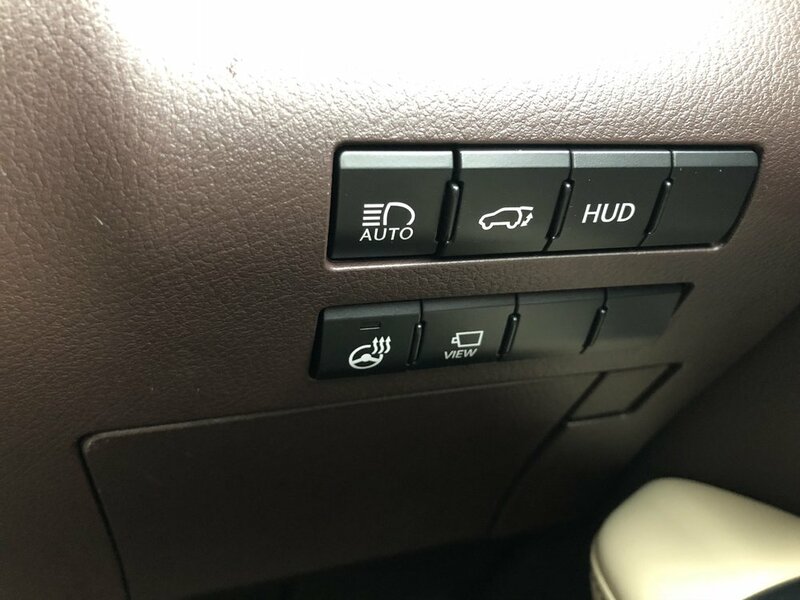 Another feature is the Rear Cross Alert, which detects if anything is behind the vehicle and sounds to warn the driver if potential impact may occur. Brakes are applied if the driver fails to respond to the buzzing. The RX450h comes with a colour HUD, Heads UP Display which projects important information on to the windscreen in the eyeline of the driver. Speed and road signs are shown as standard, but the display can be changed via the button beside the driver. I picked up the Lexus on a horrendously wet Saturday and I happened to be already soaked from riding my motorbike to a bike launch. The comparison in journey home to the ride up was dramatic. I sat in the luxurious leather seat and turned the seat heating on to level three. I waked up the heating in the car to 27 degrees and pressed the excellent control buttons to put the blower on to my wet through socks. I settled in and pulled away from Lexus Guildford. I felt good. The car pulls away so smoothly, quietly rolling along on electric power until you put your foot down and the petrol engine kicks in. The harder you put your foot on the pedal determines how quickly the engine cuts in. The RX450h has the performance to shoot you forward rapidly if you so wish. I however left the dealership sedately still warming up and drying out. I eased myself through the Saturday traffic around Guildford and picked up the A3 South. Once out of the congested section of road I was able to get the car to cruising speed and it was great. The automatic box is smooth and you don't detect the changes unless you drive the car hard. If you want to do this then you can engage Sport mode, one of the three driving modes available. In sport the acceleration increases and the suspension tightens, the car is more responsive. 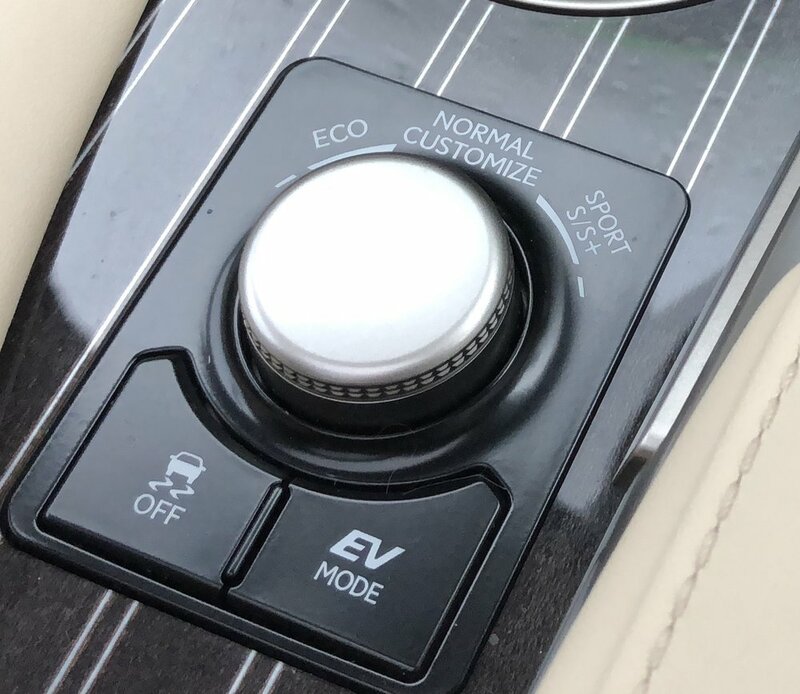 In Normal mode the car is more economical, gear changing and throttle response is less aggressive conserving fuel and providing a softer ride through the suspension. In ECO you are being much more economical and the car adapts to give the best fuel economy. You can also choose to enter EV mode and speeds under 30 mph. This is full electric mode and is ideal in confined areas like car parks. The RX range consists of entry level SE, the Luxury, F Sport, and the top of the range Premier. The best selling model is the Luxury. Lexus have introduced a Sport version, with different sportier styling and detailing. Black exterior detailing is a recurring theme, with a black finish on the large ‘Spindle’ style grille and on the 20-inch five-twin spoke alloy wheels. Also finished in black are the door mirrors, while around the back, the sporty looking rear diffuser also gets a contrasting black makeover. The Sport shares the 3.5L V6 engine and hybrid system,as the Luxury option which develops 308bhp. Power to the AWD system is via a CVT transmission. Price around £51,645 is in keeping with the RX 450h Luxury model. Detailing on all the range is striking with L shapes featured in headlights, rear lights and throughout the body. The RX is AWD which gives great handling to the SUV, both on and off road. During my time with the SUV I tested it on some trails, consisting of mud and stone which had suffered from the melt of the recent snow. The Lexus performed well and never lost traction. The ride height is good and rode over any protruding flints, that could have possibly scrapped the underneath. You will see this in my film review on Youtube channel MrJezwebb. Playing music through the superb Mark Levinson sound system is a wonderful experience. Navigation is simple using the built in Sat Nav, which is displayed on the central monitor. Inputs to this are through the the mouse to the left of the driver. Large boot space easily accomodates shopping, luggage, bikes or sports kit. Seats can also fold flat to increase carrying capacity. 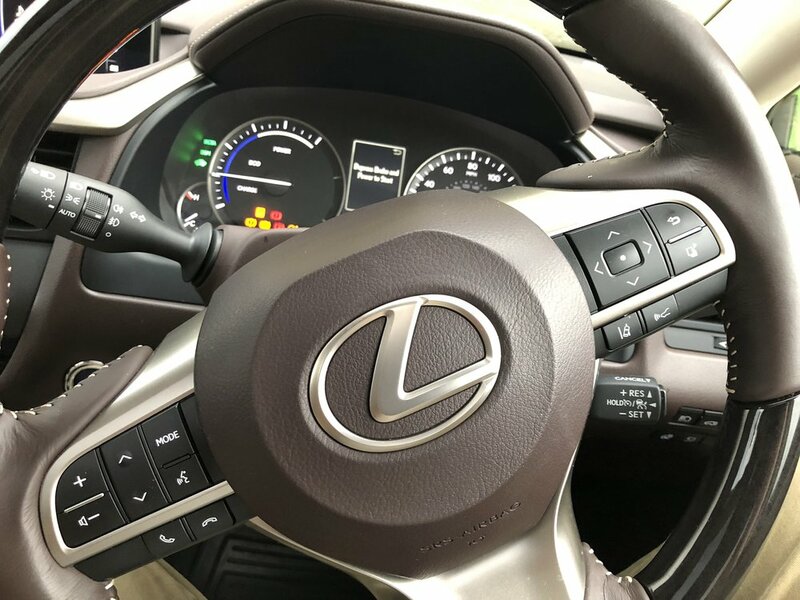 I loved the luxury feel of the RX450h, it felt special driving it. The seats envelop you then the features included captivate. Play music through the superb sound system via Bluetooth from your phone. Drive in safety with all the high tech fitted and relax in the knowledge that Lexus safety system + is aiding you, your passengers and the people outside too. This SUV accomodates all your needs and your passengers. Huge load space in the rear and nice touches throughout the car allow for cups, laptop charging etc. If you want to adventure off the beaten path, then the AWD system can cope with off roading and allow you to enjoy the countryside to the full. If you test one you will buy one.